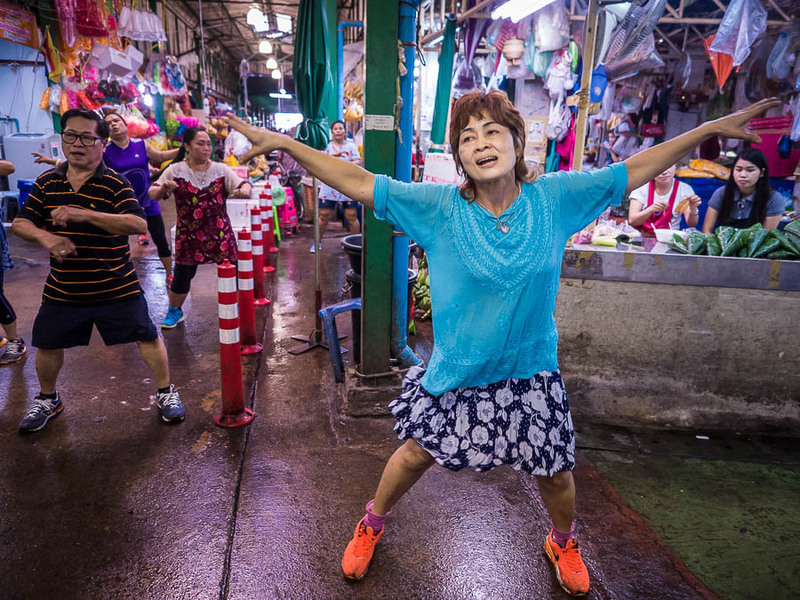 A woman in an aerobics class in the Flower Market in Bangkok. 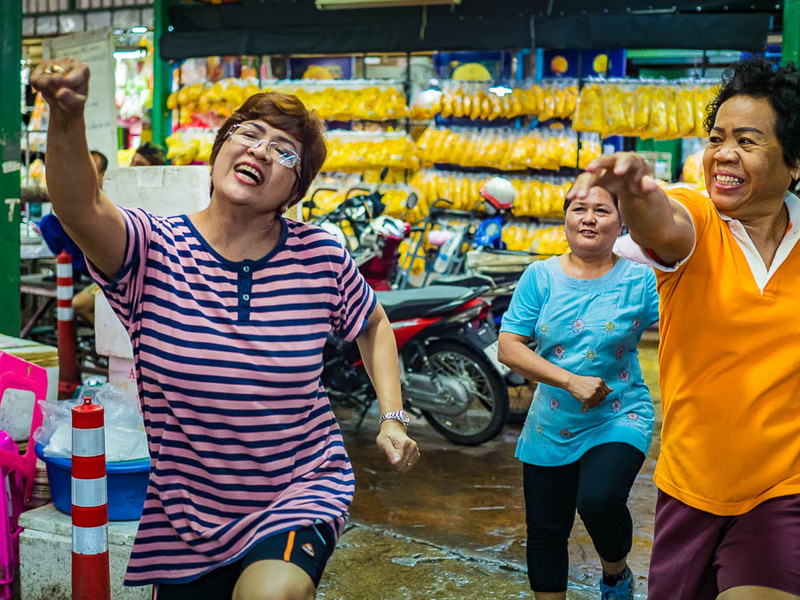 I went down to the Pak Khlong Talat, Bangkok's old flower market, to see how it's changed since the city kicked out the street vendors that used to surround the market. 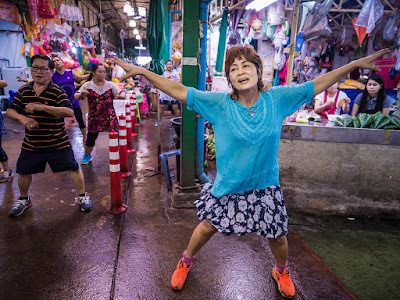 I walked into the market and heard the unmistakable sounds of an aerobics class. 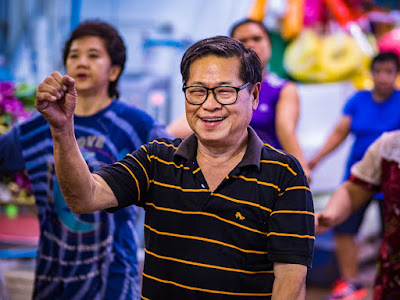 I followed the music to its source and found an energetic instructor leading a class of about 10 people in a vigorous exercise session. 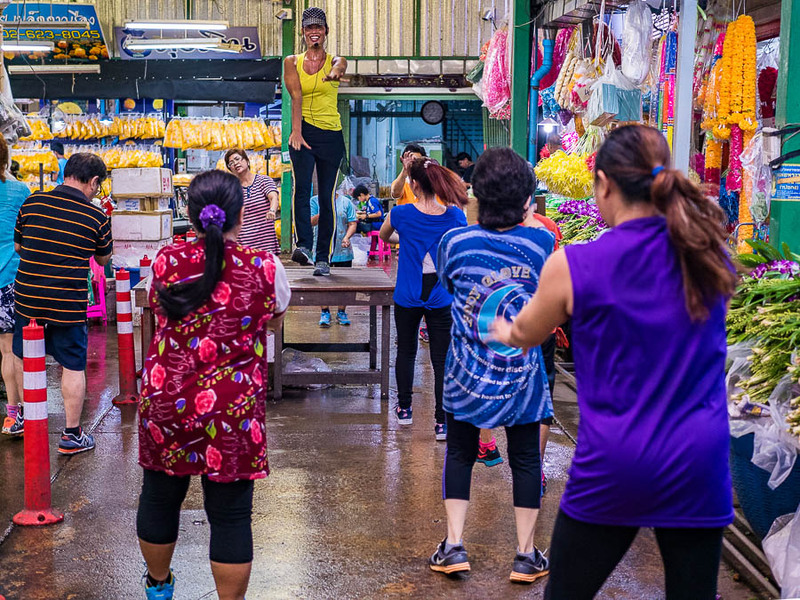 The instructor (on stage in yellow tank top) leads an aerobics class in the flower market. These public exercise classes are common in Thailand. Lumpini Park, a large greenspace in the city's business district, hosts dozens of exercise classes early every morning (around 06.30AM). In provincial towns, the classes are usually held in the early evening, right around sunset. The class in the flower market starts about 07.00 and ends at 08.00. The only man in the class works out. A few months ago I accidentally ran into the exercise class - I got there just as it was ending and didn't have much time to photograph it. This time I got there just after the class started so I stayed and photographed. Women enthusiastically participate in the class. The yellow in the background is marigold garlands for sale. I started photographing and the people in the class couldn't have been happier to have me there. I stayed for most of the class. When the class ended I made a portrait of the instructor with my Fuji Instax instant camera and gave her the print. It was too dark in the market to photograph the class with the Instax, but I am getting prints made of the "real" photos. The first time I saw the exercise class, I didn't ask about the schedule. I just sort of assumed it was a daily thing. This time, I thought to ask the instructor about the class and learned it's on Thursday mornings from 07.00 - 08.00. I plan to go back to the market next week to photograph the class again and drop off the prints from earlier today.